Raita Dip and "The Weight Loss Trap"
Happy Fall, y'all. And hopefully, goodbye to hurricane season. We in Northern Georgia were predicted to be in the path of Hurricane Irma last week as it moved inland. As it turns out, the storm deflected West and we were just outside the path. Even being outside the path, and even with Irma being downgraded to a tropical storm by the time it got near here, we got winds, torrential rains, massive trees were felled and power lines were down. Schools were closed for 3 days. Traffic lights weren't working. By some miracle, we didn't lose power, but most of my neighbors were without power for up to 4 days. I can't begin to imagine how hard life must be for people who were directly hit by the hurricanes. The weather is slowly cooling down in these parts. Today's recipe is an uncomplicated dressing/dip inspired by Indian raitas or yogurt-based salads. You simply stir together a few basic ingredients, and then pair the dressing with any cooked or raw vegetables of your choice. Stir together and store in a covered container for 2-3 days. Use as a dip or a salad dressing. While making golden adais, I impulsively grabbed some of this raita dip and a box of salad greens from the fridge. The combination turned out to be fantastic. 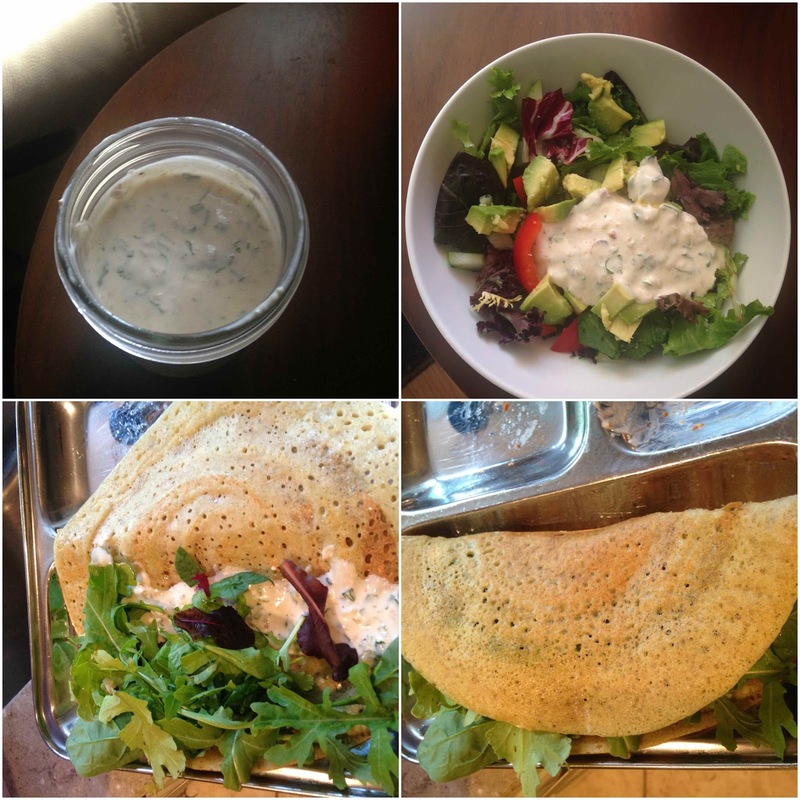 Spread a tablespoon or two of the dip on the adai and add a handful of salad greens. Roll up and enjoy right away. Especially in summer, this was a cool, light and refreshing meal. Back in February, I wrote about being back to square one in terms of eating and exercising habits. Summer rolled by and we had a very happy and busy time with friends and family visiting for four solid months. And this week, at the start of Fall, I find myself...drum roll, please...still at square one! So much of my daily well-being and happiness is linked to one factor: my energy level. On days when I am full of energy, life is easy and good- I can run around with my kids, I take pleasure in getting chores done, and I can do everything I need and want to, for myself and others. On days when my energy flags, even the ordinary routine feels like climbing a mountain. Thinking of how to keep up my energy level consistently has me thinking about the trifecta of diet, exercise and sleep. We're slowly getting better at this whole sleeping thing, and I'm doing what is in my hands- which is to get to bed early, ready and eager to grab what sleep I can. As for exercise, I'm walking as much as I can- with some combination of the toddler in a stroller, the dog on a leash, and the kindergartner tagging along, since all 3 of them love being outside. But I know that I need to sit with my calendar and pencil in some formal exercise time- swimming laps, and classes at the gym. I need that kind of structured exercise; it did me a world of good the last time I fit it into my life. As far as diet goes, I know what works for me and I just have to get back into the routine of doing it. -Exercise is critical to good health but studies show that it is not an especially reliable way to keep off body fat. 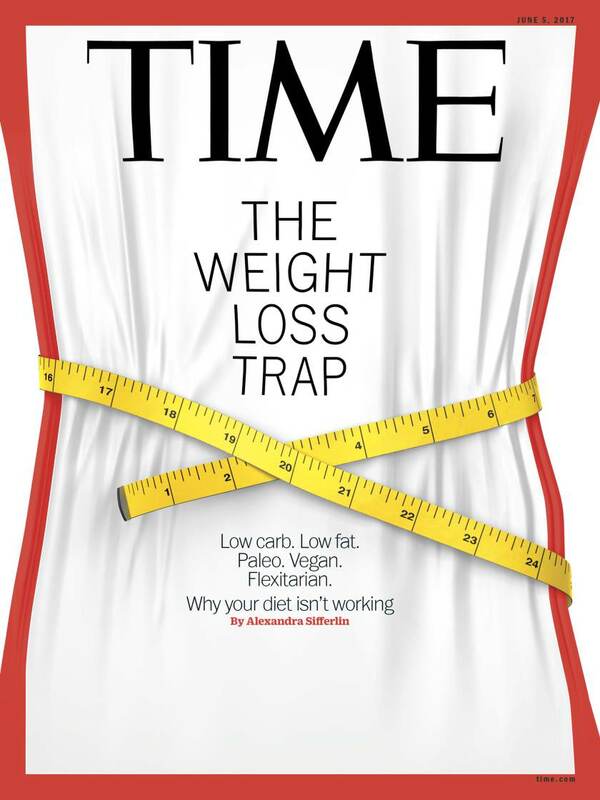 -Individual responses to diets vary enormously. The key to weight loss is to personalize it and to find your own way there. No two people lost weight in quite the same way. -Among people who lost significant amounts of weight and kept it off, the one commonality was that they made changes to their everyday behaviors. -A person quoted in the article said, "Ultimately, I fell in love with taking care of myself". This resonated with me- my own life improved dramatically once I stopped thinking of diet and exercise as this awful thing, and instead started experimenting for ways to make it enjoyable and effective. -The same person said, "My advice is to focus on each day...weight loss is a journey, not a sprint". Again, solid advice and a plea against doing anything drastic and unsustainable. -When you lose weight, your resting metabolism slows down- so there is a biological obstacle to losing weight, and it is easy to gain back the weight that is lost. This is a sobering fact. -We don't fully understand weight loss and gain. Weight gain could be influenced by environmental factors and by our microbiome, the trillions of bacteria that live in and on our bodies. 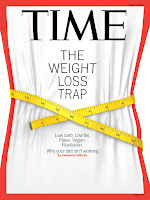 -Most people don't need to lose massive amounts of weight, to become "skinny" or fit some perfect size, to be healthy. For most people, a 10% weight loss (eg. a 150 lbs person losing 15 lbs) is enough to produce noticeable improvements in health, such as blood sugar control and blood pressure.